New York, NY, September 21, 2007 --(PR.com)-- CoverCase announced today the release of OnyxCase™, LeatherWrap™ and SkinWrap™, three unique cases specifically designed to complement Apple's new Classic iPod. Each case offers excellent protection against scratches and dents and is designed to complement any style. OnyxCase is made of Hard, black leather with contrasting stitching and an integrated Flip Stand that's professional enough for a board meeting and fashionable enough for a date. LeatherWrap for the new iPod Classic offers complete protection in a sleek, neoprene armband that's perfect for protecting ipod like iSkin while working out. 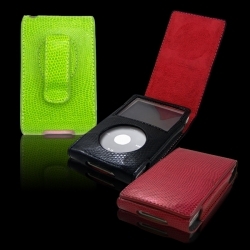 SkinWrap for iPod Classic is a two-tone case made of durable silicone that provides sporty protection for people on the go. That includes a full screen protector, belt clip and video stand.